St. Valentine of Brazil? | Walk with us! The statue of St. Anthony of Padua is brought from a church for an outdoor procession. Wednesday night was the final night of the novena of prayer dedicated to St. Anthony of Padua, a very popular local saint (note: I think St. Valentine got lost crossing the equator because in this part of the world lovers choose June 12 to exchange cards and flowers, and to dedicate songs on the radio; youth were praying to St. Anthony to send them someone to love). Pedro Paulo, the seminarian spending his pastoral year at the parish, asked me if I wanted to participate in the procession. I said “Yes! Of course!” I really did say that, in English, because he wants to practice his English with me (and he needs all the practice he can get). He led me six blocks to St. Anthony church, while it was getting dark (at 6 PM – it’s winter here), where a crowd was gathering. The rosary was being prayed and pastoral assistants were scrambling around, getting everything ready. We set out in procession pretty close to 7 PM. 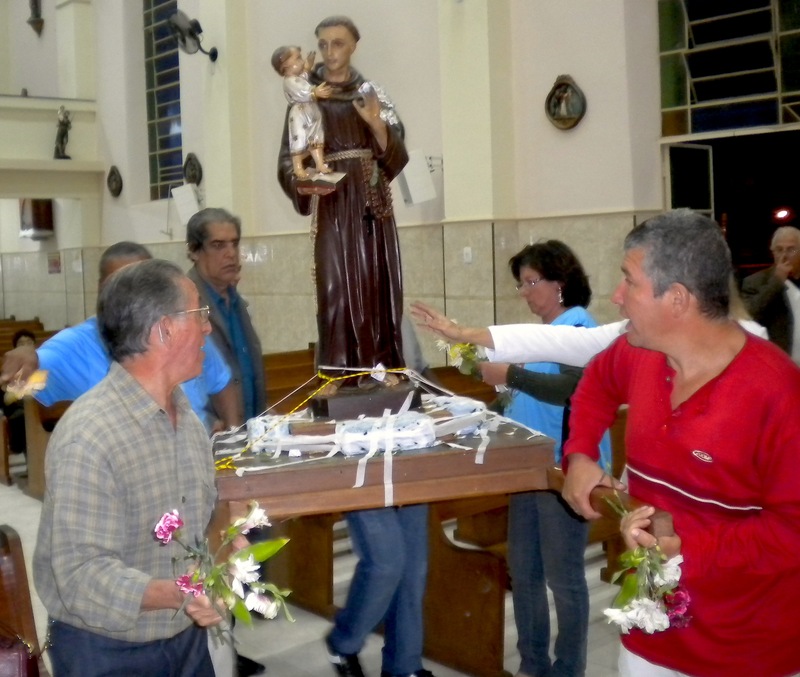 Four men and four women lifted a small portable platform on which was carried the statue of St. Anthony. A car pulled up behind with a sound system installed so that the priest could lead the prayers. A pretty good-sized and talented musical group led the singing, and we set out over the streets of Lavras. 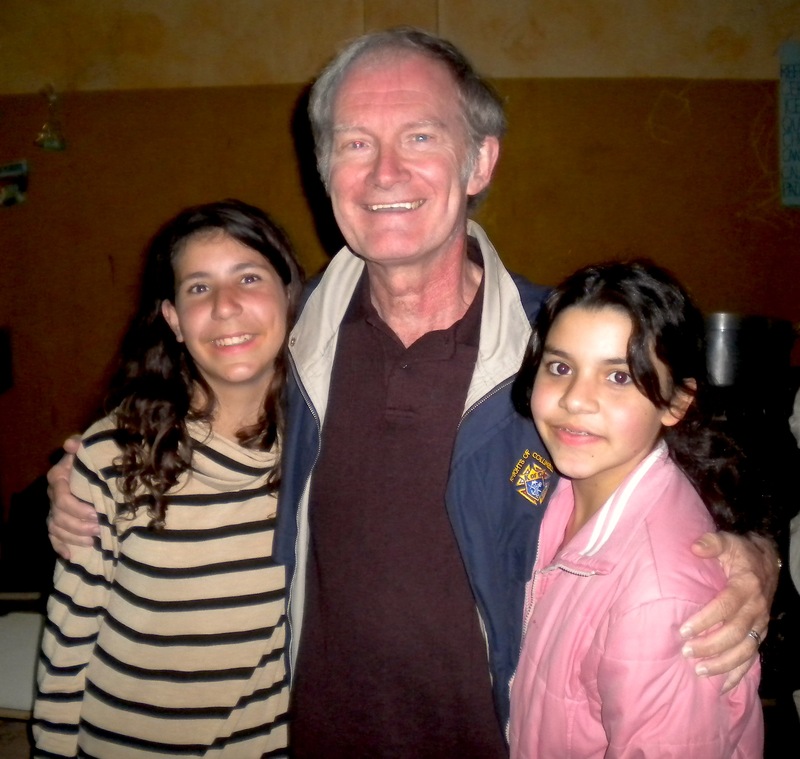 I recognized some of the songs which were written by our own SCJ priest-composer Fr. Zezhino. Some people opened up their windows and doors and waved as we passed by. So far, this procession was very similar to rituals I have participated in in Latin America, East Chicago, or Houston — religiosidad popular. When we returned to the church, after about 45 minutes, an altar was set on the steps (about 20 feet above the street level) and another musical group, heavily electrified, began to play very upbeat music. When we got to the altar and turned around I was amazed to see that the crowd had tripled in size! They filled up the whole street in front of the church. The celebrant, Fr. Antonio Marcos, who works in a center to heal drug addicts, began to stir up the crowd in a very charismatic style, aided by musical riffs from the keyboard and guitar. He called the people to conversion, to turn their lives over to God, and to put their faith into practice. Suddenly I realized that Brazil has a different flavor to its rituals. The SCJs here in the parishes have kept up all the traditional practices of the faith while challenging people to study and learn more and put their faith into practice. The church in the US had the same opportunity after the Second Vatican Council but we for the most part chose to cast aside our popular devotions, and I think that is a shame. I’m glad I will have a couple weeks to see how the blending of popular devotion and faith formation is works in practice.